Storing your firearms and ammo to keep them, and the people around them, safe is important. In many States it's also the law. Common sense (and in many States the law) dictates that you should keep your guns locked. But what if you also want to be able to get to them quickly in an emergency? The solution for us is to put our handguns in a lockbox with a fast open combination lock. The criteria that we use to evaluate lock boxes are: 1) number of handguns that he lockbox can hold, 2) security, 3) ease of opening and 4) price. One of the best companies for gun storage is American Security Products. We use a 2-gun lockbox from them since it easily stores two handguns and extra magazines, is very secure and is easy to open without looking for a key or spinning a combination dial. 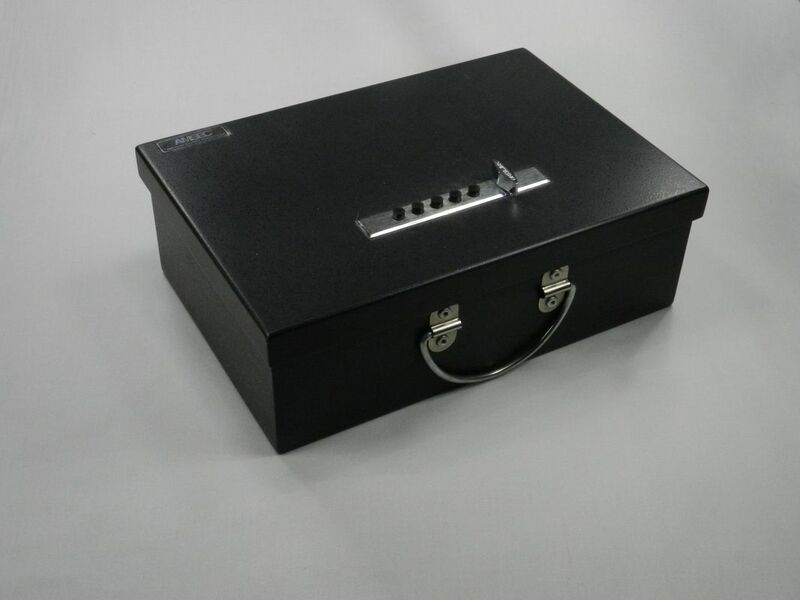 You can buy this lock box at Amazon. In addition to locking our handguns we keep our carbines, rifles and shotguns locked too. For this we chose to use trigger locks rather than buy a large gun safe since this makes it easier to “grab and go” with any firearm. The criteria that we use to evaluate trigger locks are: 1) security, 2) tightness of fit, 3) ease of fit and 4) price. 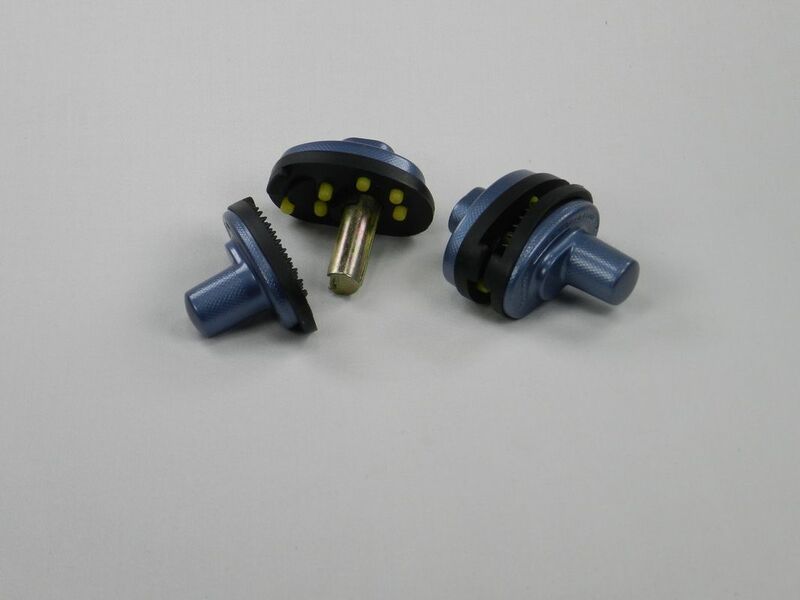 These locks are made of steel and zinc with protective rubber pads that protect the firearm from scratching and have a 4 pin tumbler cylinder that opens with a key. They fit all of our firearms, although sometimes we have to put them on upside down due to the shape of the trigger guard. You can buy these trigger locks at Amazon. With firearms comes the need for ammo, and the need to store it and carry it to the range. 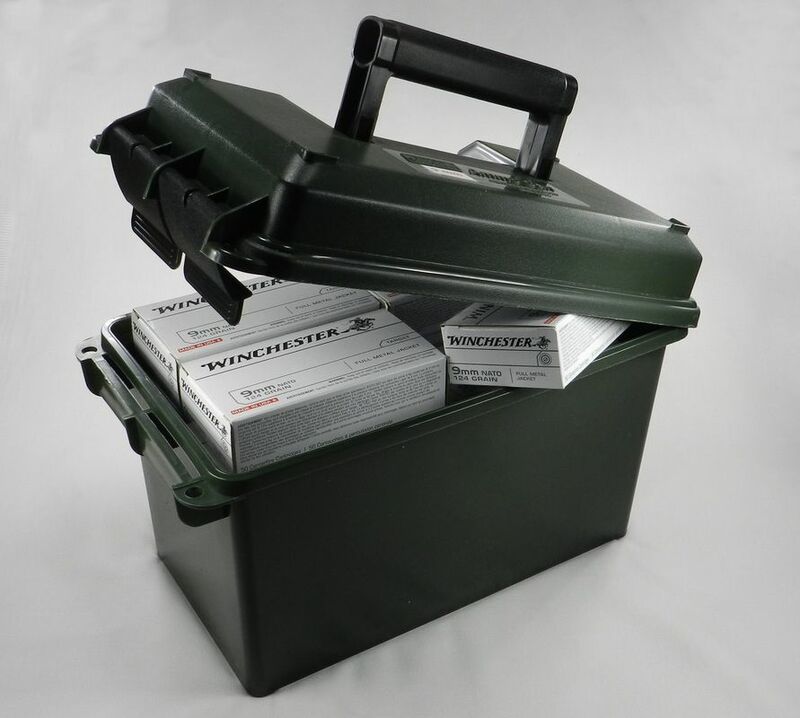 For safety’s sake storing your ammo in an easy to carry container is the best option. The criteria that we use to evaluate ammo cans are: 1) ammo storage capacity, 2) ease of carrying, 3) weight of case and ammo, 4) protection from the weather, 5) security and 6) price. Although many people like the traditional metal military ammo cans we prefer the MTM Case-Gard AC50C-11 50 Caliber Ammo Can. These cans are made of polypropylene plastic, have a sturdy handle that folds up and down, a reinforced bottom, thick sidewalls, ridges on the bottom for slip resistant stacking, a water-resistant O-ring seal, places for two locks to keep it secure and a double set of heavy-duty closing latches to make sure it stays closed. The internal dimensions are 5.8"(L) x 11"(W) x 7.2"(H). The external dimensions are 7.4"(L) x 13.5"(W) x 8.5"(H). We really like that you can take it straight from storage to the range, so we have one for each caliber of ammo, two for our assorted magazines and one for what we need at the range that day. You can buy these ammo cans at Amazon. Since we normally buy ammo a case at a time to get the best price that means that we always have more ammo than our ammo cans can store. So, to store the other ammo we needed ammo crates too. The criteria that we use to evaluate ammo crates are: 1) ammo storage capacity, 2) ease of carrying, 3) weight of case and ammo, 4) protection from the weather, 5) security and 6) price. 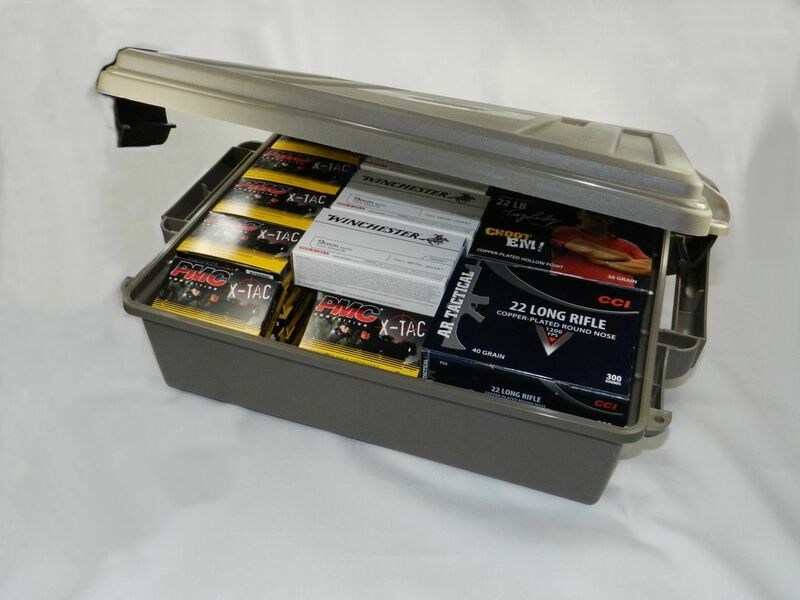 For additional ammo storage we use the 4.5" deep MTM ACR5-72 Ammo Crate Utility Box. Like MTM’s smaller ammo cans these ammo crates are made of polypropylene plastic, ridges on the bottom for slip resistant stacking, a water-resistant O-ring seal, places for two locks to keep it secure and a double set of heavy-duty closing latches to make sure it stays closed. They also have two strong handles mounted on sides for easy carrying. The internal dimensions of the ammo crate are 13.5"(L) x 14"(W) x 4.5"(H). The external dimensions are 15.75"(L) x 19"(W) x 5.25"(H). Although these crates can carry up to 85 pounds of ammo (or other gear that you want to store) we find that the crate weighs probably closer to 50 pounds when full of ammo. MTM also makes this crate in a 7.25” high version (MTM ACR8-72), but we found that crate to be too heavy and unwieldy when it is packed to the brim with ammo. You can buy these ammo crates at Amazon. To keep our ammo cases and crates secure we needed a small lock that would keep them closed, but would also be easy to use at the range without looking for a key. The criteria that we use to evaluate ammo can/crate locks are: 1) security, 2) ease of use, 3) durability, 4) flexibility and 5) price. Although a little pricy at $9 to $12 per lock we ultimately decided to use the Lewis N. Clark Travelsentry 3-Dial Combo Lock with Keys since it met all of our criteria the best. 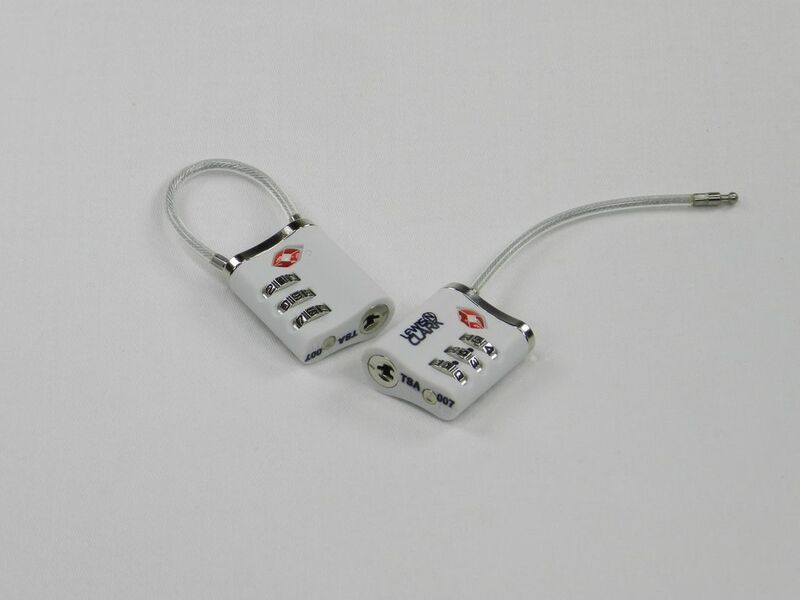 The locks have a resettable three-dial combination or can be opened with a key. The lock body is metal and plastic with a 70mm flexible, coated steel cable. You can buy these locks at Amazon.